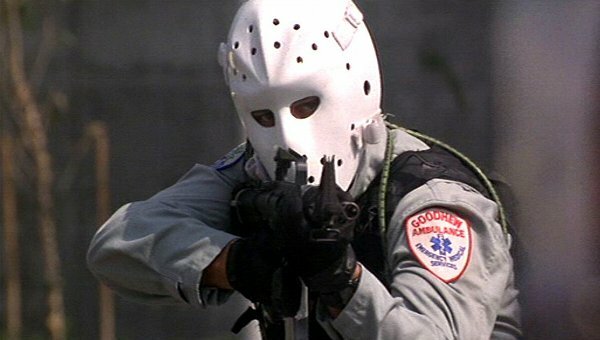 After seeing Heat (Michael Mann, 1995) this weekend, I took an Internet jaunt to find something rare and beautiful: the intelligent action movie. Now, I'm not a true action film buff (I have yet to see Lady Terminator (Djalil, 1988), which has been on the shelf in my apartment for years), but I know my way around the genre, at least a bit... I have a healthy and justifiable habit of falling in love with random action films, like Terminator 2 (Cameron, 1991) and The Rundown (Berg, 2003), and this habit stretches back into my adolescence, when many of us first discovered the great action heroes (most of whom are now in The Expendables). With the encouragement of my action film literate roommate, I've seen a number of the Van Damme/Kirk Douglas/Steven Seagal canon, and on my own power, I've gotten to check out some of the classic action sci-fi's: Aliens, Starship Troopers, and The Fifth Element. I've also engaged, on a cursory level, the kung-fu classics, including old-school Jackie Chan and Jet Li, kitsch-fests by Seijun Suzuki, and Samurai classics like Sword of Doom and Lady Snowblood. So when it comes to this discussion, I've at least got the safety off and my finger on the trigger. Now, when I reference the hazy concept of the "action film," you'll just have to take for granted that I'm trying to keep it simple. It's pretty much any film whose, you know, primary dramatic tension is caused by, you know, violence, and resolved by some, like, extended fight scenes. I know, I know, there are a LOT of films that fit into this category. You could go as far back as Buster Keaton and old Westerns. For my own part, I'm focusing more on films after the 1970's, just to make it a little easier on myself. Anyway, I think this is when they started acknowledging "action" as a genre unto itself, with its own section in Blockbuster, totally separate from "drama" and "family" and "music videos." When I say "intelligent," I'm totally not talking about cryptic or artsy, though I'm not specifically excluding those robust virtues. I'd call Nolan's new one cryptic, and even complex, but its intelligence isn't quite what I'm talking about. When I say "intelligent," I'm talking about action movies that feel real, and clever, without relying on gimmicks or twists; action films that don't pander to their audience. I know this doesn't necessarily make a great action film per se, and in fact, I'm ruling out all my personal favorites: Terminator 2, The Matrix, 300, The Killer, and Unleashed. Nay, I'm talking about a quality that's almost completely missing from action films: subtlety and restraint. I know, I know, it's a very narrow use of the word "intelligent," and I should have been more specific. I'm sorry. I'll do better next time. See, this is what's so great about Heat: it cuts a razor-thin line, making violence intense and dramatic (one of the best gun battles ever filmed), but also evoking a sense of coolness and procedure. The military-style advance/cover/retreat pattern was goddamn breathtaking, but it's clear that for these characters, it's a day's work, familiar terrain on the roadmap of a disciplined and violent career. The film is refreshing free of over-the-top reaction shots, stunts (was there even a single stunt in this film? ), and exposition about plots and heists. There was a time when I thought Reservoir Dogs was pretty realistic, but now it seems like another heist movie that thinks it's clever. There's no workaday rhythm to it... just a lot of shooting, hysteria, and bad planning. And when you know how to wield the Hammer of Subtlety, you can make a film -- even a heavy-duty action film like Heat -- and still populate it with compelling characters and studies of personality. We see dimensions in Vincent and Neil that we never got to see in John McClain, despite the latter's bevy of movies and constant return to his marital and family problems. These characters express themselves in every aspect of the movie... in their withered relationships with their families, with their professional conduct and tactical decisions, and in their short, poignant moments with one another. 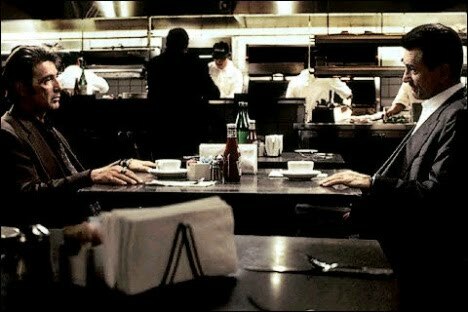 It's hard to even count all the insights we get into Neil, including those he shares with Vincent -- his weariness, his strength of will, his loyalty to those close to him -- and those wherein they so sharply contrast -- their motivation, their use of authority, their ways of expressing personal responsibility. It's a study in character consistency, played out over some of the sickest street-set gunfights I've seen in my cinephiliac adulthood. The only movies I can think of that do the same thing, at least so far, are Luc Besson's earlier action efforts, Leon The Professional and La Femme Nikita. Besson walks a strange tightrope, essentially filming exotic romances built on action-movie premises and occasional set-pieces. La Femme Nikita was a joyous and tragic film about love frustrated by the call to violence. The Montmarte setting, practically sweating with sunlight and Paris accordion music, is a stage for Nikita's rebirth, which is accompanied by a romantic reawakening. It's unfortunate, what we know about the girl: that this rebirth is financed by a top-secret assassin's guild, and that in payment, she has to carry out its missions. The film becomes a study in tension between vulnerability and alienation, guiding us through the love affair between Nikita and Marco, and confronting us with the unbridgeable gap between them, the result of Nikita's need to keep her profession a secret. What allowed this to work so well... what kept it human... was that the violence was quick and nasty, and never romanticized or played for cartoonish effect. It just wouldn't have been much of a movie in John Woo's hands. As a side-note -- loosely related to the raw authenticity of this film -- it's been frustrating to see the Nikita spin-offs, one after another, that miscast the main character as a steamy supermodel. Anne Parillaud is beautiful in the way that models are never beautiful, because their specifications are so precise. She's gawky at times, with a messiness around the edges of her beauty, and Besson makes it clear that for her, hypersexuality is a struggle. I'm just writing this aside to lament the subsequent casting of Peta Wilson, Bridget Fonda, and Maggie Q in reprises of the roles. They're lovely, don't get me wrong, but part of the sincerity and charm in Besson's version is that Nikita could slide so smoothly from alluring to unremarkable. Leon: The Professional shares many of Nikita's virtues, being a study of a simmering relationship between two outcasts, each shackled in their own defenses. Perhaps the slightly Cassandratic father-daughter relationship between Leon and Mathilde is what allows Leon to expose his vulnerable side to Mathilde, despite normally being so detached and pure-business about his murderous profession. It's striking how similar Mathilde is to Nikita -- both are wrenched, through violence, from broken former lives, and both begin to express their nascent sexuality under hostile circumstances. Both are being trained as killers. Mathilde is compelling as Nikita's spiritual successor. Again, the violence is quick and professional (movie title reference LOL), and it doesn't infringe upon the audience's engagement with the characters. These characters, in turn, can be subtle and nuanced, and know how to handle a firearm with a telescopic sight. I contend that these three are all action movies, but that they're rare cases in that the action doesn't crowd out the human drama. Anyone have any more suggestions for films like this? Something I'm missing? Of course, there are also films like the crime flicks of Jean-Pierre Melville. In the interest of time and space and the patience of any poor readers that might show up, I won't talk about his various milestones, like Le Cercle Rouge and the brilliant Army of Shadows. 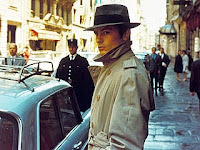 I'll just talk about Le Samourai for now. In my estimation, it's the most "actiony" of his films I've seen, which tend to fixate on other things, like the psychology of characters in times of war and stress. Le Samourai is like the previous films in that the violence is quick, dirty, and downplayed, tucked in the cracks between stalkings and stake-outs. The meat of the film is the connective tissue between these murderous moments, which are over in a flash -- the periods where Jef builds and stresses his relationships, which are inevitably constructed around his dangerous mode of employment. Jef's story is not so much a human story, filled with multi-dimensional characters. Rather, it's a minimalist, almost formalist piece of filmmaking, an exercise in tension and perception and focus, with a pervasive sense of abstraction: the bird, the blank spaces, the two woman as object and accessory. If you're curious, I'd recommend checking out Le Samourai as a companion piece to Clooney's new hit-man film The American, which (according to a couple reviews I've read) has the same sort of silent, solitary mood. I'm guessing The American replaces Le Samourai's abstract minimalism with a more tactile reality, but I suspect these films will reward comparison. I'm rather excited to see Clooney as a tacit, technically-savvy specialist, rather than a moody socialite. Hopefully it will turn out well. That aside, yay for the intelligent action film -- the movie that uses action beats, but provides enough space and counterpoint to them that it can avoid falling into the standard action blockbuster paradigm (no conflict or resolution except for manichean violence). These are action films that make good on those genre tropes, but ultimately make their own statement, rather than letting their genre speak for them. Please, if anyone reads this and it makes them think of some other movies, let me know.